With over 25 years at the forefront of technological advances in measuring material size and shape in real-time, Microtrac is the established leader in delivering innovative analysis solutions. Microtrac is proud to announce our new synchronous size and shape analyzer, Sync, which integrates the world’s leading laser diffractiontechnology with the world’s leading dynamic image analysis technology – Same bench, same sample, same run, same flow cell, same user interface. Users can now get their tried and true particle size distribution together with particle morphology in a single, easy to use graphical user interface. Using our patented methodology, the Sync interrogates particles, wet or dry, with laser light while simultaneously a high-speed digital camera takes images. The data collected is processed by our FLEX software and presents the user with particle size and shape information. While the software is powerful, the graphical user interface is intuitive and easy to use. The Sync enables users to get more detailed information about their material than ever before and will quickly render size-only instrumentation outdated and incomplete. Please join us for an in depth webinar on the features and capabilities of the Sync. Let us share with you how Microtrac is changing the paradigm for material characterization. Unable to attend? Register to receive the recording! This free webinar, Metal Powders Quality & Process Control Based On Powder Morphology airs on Thursday, October 19, 2017. If you’re unable to attend, we welcome you to sign up to get the free recording. Learn how you can identify good, bad, and ugly particles with advanced data analysis capability featured in Microtrac's Imaging technology. This webinar will explain the following; how to identify contaminants during production/handling/packaging, impact of too high/low aspect ratio, surface roughness, sphericity, or transparency has on final product quality, seeing is believing - view particles, search capability - display results based on user defined conditions, benefits of comparing morphological parameters, and graph manipulation. Dynamic Image Analysis is ideal for measuring the size and shape of materials from several microns to several millimeters. Concentrations of fluorine, chlorine, bromine, iodine, and sulfur can be determined and accurately by using a combustion ion chromatography (CIC) system combining an Automatic Quick Furnace Model AQF-100 which safely combust samples with an ion chromatograph. If you’re still using sieve analysis for your particle analysis needs, you may be faced with frequent measurement errors such as failing to collect the complete set of particles from each sieve, mis-weighing, incorrect data entry or calculation errors with distribution percent values. Not to mention this method can be frustratingly slow and labor-intensive. Image analysis gets you past these hurdles with minimal effort. In this webinar you'll learn about making the transition to image analysis from sieving! Microtrac, Inc. is a particle characterization instrumentation company dedicated to particle science and customer satisfaction. 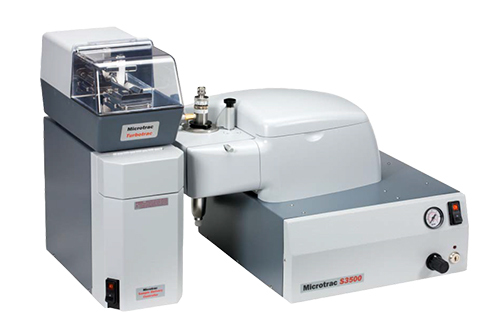 Microtrac released the first commercially available particle size analyzer using laser diffraction. We have over 40 years particle characterization experience and technology. This free webinar, Measuring Electric Power Generation By-Products aired on on Thursday, July 27, 2017. Would you like to collect 3D particle size and shape data of your materials ranging in size from 35um to 35,000um? If you have a need to identify and quantify different particulate components in one sample, this webinar will show you how. This can be easily accomplished with patented 3D image analysis and use of the search query and filter/classification features in the software. Find out what advantages there are with 3D image analysis technology and go over its important advantages over 2D technology. Go in-depth with Microtrac’s powerful, patented 3D measurement software. The reporting is simple, powerful and flexible. Learn more in our webinar! Terry Stauffer has over 40 years of particle characterization experience. He has worked for all the major players in the particle analysis industry at some point in his career. He will be answering all your image analysis questions at the end of the webinar! 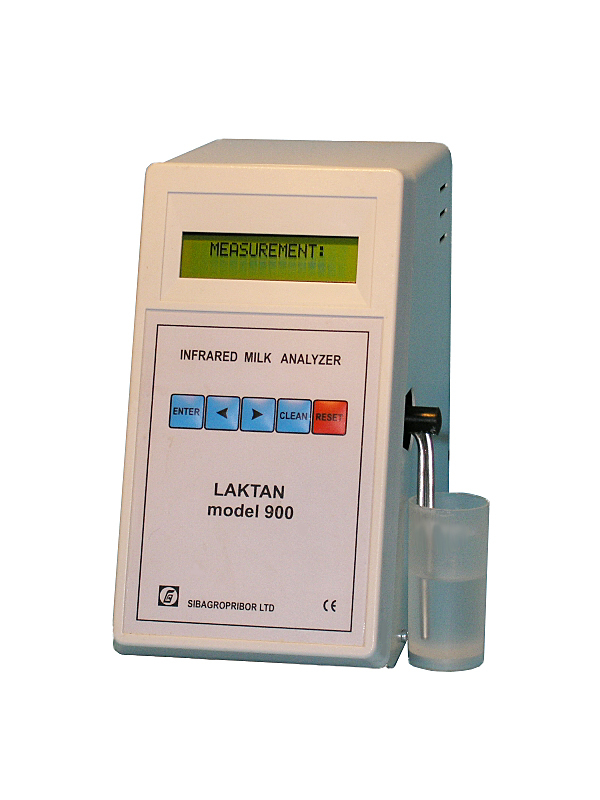 Taking into consideration keen interest to our new product (Laktan 900 Superfast IR milk analyzer) and growing market need for practical application of the Infrared method/ technology we would like to update our customers and partners on the results achieved at the current stage of our project. At present we are completing testing of the latest improved version of Laktan 900 after modification which takes into account the requirements of the Indian market. Simultaneously with this work we are preparing for launching of serial/ mass production of this model for execution of the bulk orders on hand. Besides we wish to inform our foreign colleagues that currently research work for development and approval of this method (Optical Method of Identification of Natural Milk) is carried out at the All-Russian Research Institute of Optical and Physical Measurements (VNIIOFI), Moscow, one of the oldest and the most reputed Scientific and Research Institutes in this field in Russia. According to the information published on the official web-site of Rosstandart (Federal Agency for Technical Regulating and Metrology of Russian Federation) November 6th, 2014 the new method of identification of natural milk was presented by research scientists of the All-Russian Scientific Institute of Optical and Physical Measurements to the Assistant Chairman of the Russian Federation Government Mr. Gennady Onischenko and the Head of Rosstandart (Federal Agency for Technical Regulating and Metrology) Mr. Alexey Abramov. Preliminary research work (incl. analysis of various types of milk) has been conducted at the laboratory of optical spectral instruments of the All-Russian Scientific Institute of Optical and Physical Measurements. Uniqueness of the method developed at the All-Russian Scientific Institute of Optical and Physical Measurements is that milk quality is determined by means of optical measurement of distribution/ dispensing of micron and nanoscale particles in milk. Having acquainted himself with the results Mr. Gennady Onischenko pointed out that it necessary for the team of the Institute to continue this work; he also emphasized importance of the elaborating of the instrument base for practical application of the given method. As of today there is a clear understanding of importance and urgency of this direction for Dairy Industry at all levels in Russia, and the state budget funds are allocated for implementation of this scientific project.There is no doubt that the given theme and scientific problem (development of the optical/infrared method of milk analysis) as well as development of a new affordable for the mass market IR milk analyzer for practical application of the given method are extremely complicated scientific problems, at the same time these are very important and urgent tasks, and Sibagropribor has already made a significant contribution on implementation of this task. If you’re using dynamic light scattering (DLS) for the measurement of your nano-particles, you may be familiar with the photon correlation spectroscopy (PCS) method. Although PCS is a widely used DLS method of measurement, there is a superior method. Microtrac’s proprietary approach to DLS, the frequency power spectrum method (FPS), overcomes the limitations of PCS. Heterodyne FPS gathers data in higher resolution than PCS. Having the detector set to 180° allows to measure in higher concentrations, and to even go on-line. The Microtrac FPS method effectively allows to accurately measure from sub-nanometer to several microns across the widest concentration range on the market. Joining us for this webinar is special guest, Brian Freeland from Dublin City University. He will present comparison data and talk about his experience using Microtrac’s Nanotrac Flex. This free webinar, Advantages of the Frequency Power Spectrum Method aired on Thursday, June 22, 2017. Penelitian di bidang nanoteknologi membutuhkan banyak instrumen penelitian untuk mengetahui unsur-unsur yang terdapat di suatu material penelitian. Mulai dari scanning electron microscope (SEM), x-ray difrraction (XRD), particle size analyzer (PSA) , atomic force micsroscope (AFM) dan lain sebagainya. Penguasaan beberapa alat di atas sangat penting untuk menunjang kinerja penelitian. 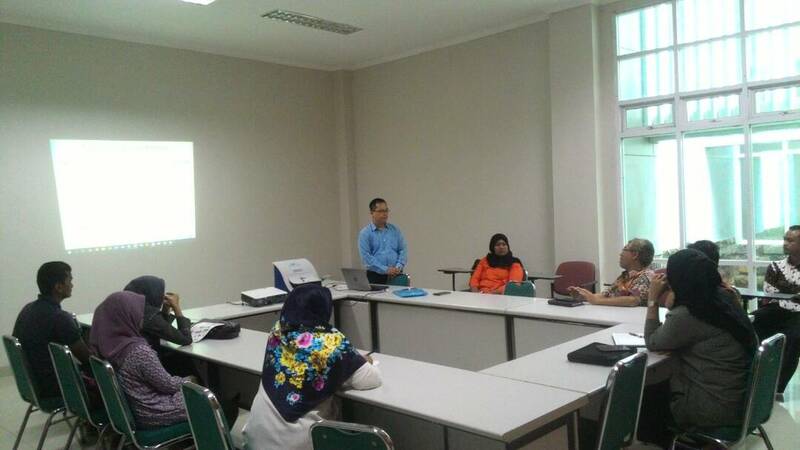 Atas dasar itulah pada hari Senin, 8 Mei 2017 bertempat di gedung Indonesia Life Science Center- PUSPIPTEK, Masyarakat Nano Indonesia (MNI) menggandeng salah satu supplier alat di bidang nanoteknologi PT. HILAB Sciencetama, untuk melakukan demo penggunaan alat PSA. PSA sendiri digunakan untuk mengetahui ukuran partikel dan berat molekul. Sampel yang digunakan biasanya berbentuk cair. Acara dibuka oleh Dr. Setyo Purwanto selaku pengurus dari MNI, kemudian dilanjutkan oleh Bapak Eddy selaku perwakilan dari PT HILAB Sciencetama dalam menjelaskan dan demo alat. Peserta yang hadir dalam acara kemarin adalah member dari Masyarakat Nano Indonesia yang terdiri dari peneliti , dosen dan mahasiswa. Tiap peserta yang hadir berkesempatan dalam menguji sampel yang telah dibawa untuk dilakukan preparasi, uji pengukuran, dan pembacaan hasil pengukuran sampel. Harapan dari acara ini adalah para peserta yang datang dapat mengetahui langkah dasar dalam pengoperasian alat PSA dan MNI akan selalu memberikan dukungan terutama unutk kegiatan yang bertemakan nanoteknologi. Masyarakat Nano Indonesia bekerjasama dengan PT. Hi-Lab Sciencetama (Suplier Alat Laboratorium Nanoteknologi Terpercaya di Indonesia) mempersembahkan event yang bertema “PSA Demo Day”. 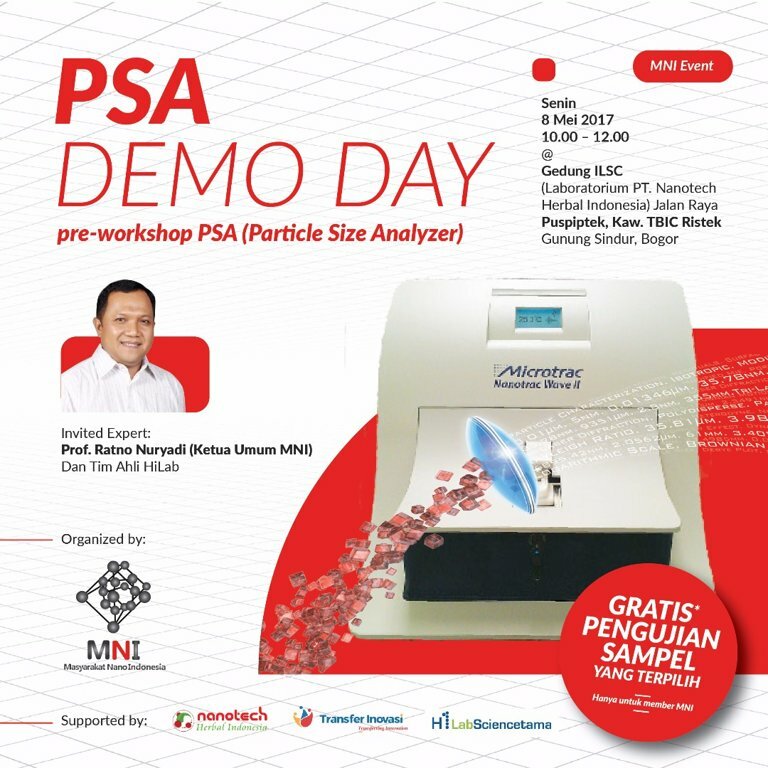 Kegiatan ini adalah bagian dari acara pre-workshop PSA (Particle Size Analyzer) yang akan diselenggarakan bulan depan dan gratis pengujian sampel yang terpilih. Acara ini GRATIS khusus untuk MEMBER MNI, dan kouta terbatas.